A striking LED sculpture by Leo Villareal sparkles and streams from ceiling to floor. The colorful 17 foot mural by Caio Fonseca dazzles the eye. Individual painted shapes are peeled and collaged onto a canvas entitled “Nimaima, 2014” created by the Colombian artist Omar Chacon. Lady Gaga, an alluring abstract sculpture by Hans Van de Bovenkamp stares from a corner. The Museum of Modern Art? Whitney? A gallery in Chelsea? Not at all! These and other artworks are on permanent and rotating exhibit in the middle of Manhattan in the lobbies of six sleek corporate office buildings located within minutes of one another. Eager to learn more about this growing phenomenon of lobby art and to find out why some of New York’s most prominent landlords and owners are investing millions for their buildings, Young Men’s/Woman’s Real Estate Association of New York (YMWREA) set out Friday, June 16 to visit 130 West 42nd Street, 1133 6th Avenue, 1114 6th Avenue, 285 Madison Avenue, 270 Madison Avenue and 505 Fifth Avenue. 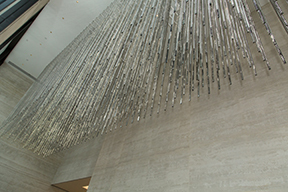 Glanzrock’s BACP curates and manages lobby beautification programs for many office buildings including two on the tour: 130 West 42nd Street and 270 Madison where artwork is leased with the option to buy. Artwork on view in the other buildings on the tour is either commissioned or purchased for the lobbies. 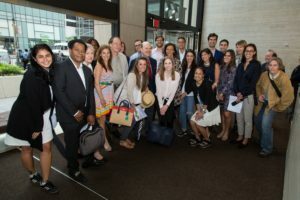 For the YMWREA members, coming from such companies as Boston Properties, Avison Young, CBRE, Cushman & Wakefield, Douglas Elliman, Colliers, NGKF, Silverstein Properties and Durst Organization, the tour was eye-opening, interesting and entertaining. Owners, managers and art directors stressed to the group how art made their buildings unique, provided energy and community and, equally important, attracted attention and added significantly to the bottom line. At Bush Tower, 130 West 42nd Street Elliott Ingerman explained why he and his partners at Tribeca Associates, Meadow Partners and China Vanke gut renovated the lobby and worked with Glanzrock’s BACP to create a gallery atmosphere. “Instead of another white lobby, we wanted a beautiful space and we got one,” Ingterman said. Anita Durst, artistic director of Chashama, , a non-profit that partners with commercial landlords to provide underutilized spaces to artists welcomed the group to 1133 Sixth Avenue, owned by the Durst Organization and described in detail Volume (Durst), a 90-feet long, 12-feet high and 6-feet deep three-dimensional sculpture by light artist Leo Villareal which defines the building. At 1114 6th Avenue Elysa Marden, vice president of Arts Brookfield for BrookfieldProperties, stated that Brookfield’s $8-million art budget “provides energy and creates community in our lobbies and buildings,” and pointed to the Fonesca murals Fifth Street C12.6 and Fifth Street C12.7 and the Lady Gaga sculpture within the lobby. On their way to 285 Madison, the group stopped for a look from the outside at 505 Fifth Avenue where architectural firm Kohn Pedersen Fox collaborated with artist James Turrell on the lobby with a dramatic forced-perspective lightbox continuously changing colors. Alex Kaskel, associate managing director, ABS Partners, praised Glanzrock as curator “for helping to make the lobby of 270 Madison Avenue pop” and introduced artist Omar Chacon whose colorful painting Nimaima, 2014 is layered with acrylic paint applied with mustard and ketchup bottles.